Car Rental Information! Click here! - This should take about 4.5 - 7 hours, depending on when (and if) you catch the ferry. We recommend Budget Rental Car because they have two offices in our area so it's easier if something goes wrong with your car. - Drive 2 1/2 hours west to Puntarenas. - Take the ferry to Paquera (Not Naranjo!). The ferry leaves every two hours: 6:30am, 8:30am, 10:30am, 12:30pm, 2:30pm, 4:30pm, 6:30pm, 8:30pm The ferry ride is just under two hours. - Drive from Paquera, through Tambor, to Cobano. (45 minutes). 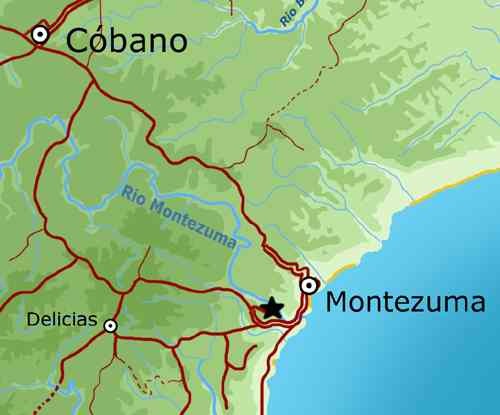 - Drive from Cobano towards Montezuma. After 2 minutes, at the first cemetary, take a right. - Follow this road for 10 minutes, until you reach the second cemetary. Take a left. - The road will split after 1 minute, and keep to the right. - Drive 5 minutes, mostly downhill towards Montezuma, and just before the asphalt starts, take a driveway on the left. Follow this driveway, staying on the left, until you reach a parking area and a yellow house, Mariposas del Sol. - Some people miss the turnoff. If you do, you'll see the butterfly gardens (Montezuma Gardens) on your left. Turn around there and go back up the hill, turning right after the second driveway past Montezuma Gardens. 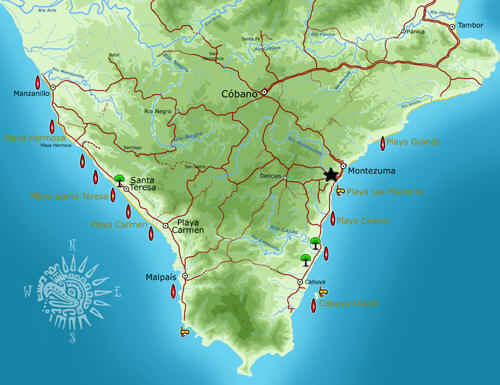 - If you somehow get to Montezuma, then ask around for Hotel Amor de Mar. From this hotel, drive up a steep asphalt road, passing Montezuma Gardens after one minute, and then 200 meters past, take a right on our driveway after the asphalt ends. - From Paquera, follow the directions above as if you just landed from the ferry. - If you want to drive south on the Pacific Coast, you can do so only in dry season, and you should time it so that you can cross the Rio Bongo at low tide. There's also an overland route to avoid the Rio Bongo, which takes you to Cobano, but it's too difficult to describe here. 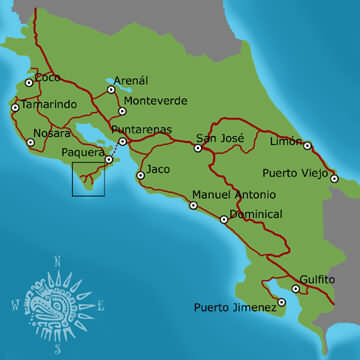 For a complete driving map of the area, made by ME (Geoff) click here: Southern Nicoya Peninsula Map. Don't trust any other maps, other than the one in the local Zoom magazine! Other than Zoom's, we have never seen any map printed in Costa Rica which has the roads here depicted even remotely acurately.